Streets all on one level with no defined pavement areas for pedestrians are putting blind and vulnerable people at risk, a charity has said. 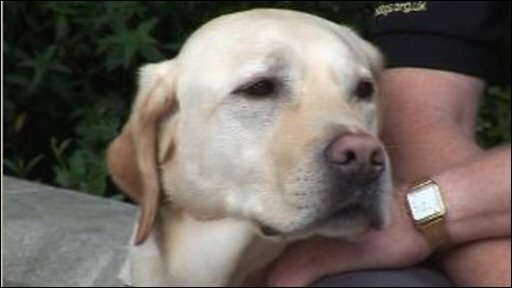 Guide Dogs is campaigning to prevent more towns and cities in Wales copying Caernarfon, which has made its town square a shared surface area. Assembly members are trying out a mock shared surface street while blindfolded at the Senedd later. The charity says a kerb edge is a vital marker for vulnerable pedestrians. Cardiff council is considering introducing shared surface streets as part of its regeneration plan for the city, but Guide Dogs is urging it to rethink. The system is based on no-one having right of way, forcing motorists, pedestrians and other road users to make eye contact and decide among themselves when it is safe to proceed. The charity claims the market square in Caernarfon, which has been redesigned at a cost of £3m, has become a "no-go" area for local blind and partially sighted people as well as the disabled, elderly and young children. It says forcing all road users to make eye contact to establish who moves first "undermines the safety and independence of vulnerable pedestrians". Andrea Gordon, Guide Dogs policy manager for Wales, said: "We know that shared surface streets are dangerous and discriminate against the safety and independence of vulnerable pedestrians. "If people can't tell where the road begins and the pavement ends, how can you feel safe?" The charity said its campaign, Say No to Shared Streets, has been backed by over 20 other disability organisations including the Royal National Institute for the Blind, Wales Council for the Blind and Disability Wales. In a statement, Cardiff council said it "is currently awaiting advice and recommendations on this issue from a working party at Westminster." How did the Briton cross the road?